Just a wedding dress on a fire escape. 1) A soon-to-be bride was wearing it around the apartment and spilled red wine on it; she quickly spot-cleaned it and hung it outside to air-dry as her mother and grandmother in rural Italy would have done. 2) A soon-to-be bride had it hanging inside, but her fiancé showed up unexpectedly. Not wanting him to see it before their wedding day, she dashed around the apartment looking for a place to hide it, in the end hanging it from the fire escape as though she were hiding a lover. 3) A single woman with very slight wedding fever just happened to see this in a thrift store and knew in an instant that it was her ideal dress. She just knew, in her gut, the same way other women know when they meet their husbands but she has yet to feel with a man. How could she pass it up? She bought it on the spot and had it in her apartment; but now this guy she’s been kind of seeing lately just texted her to say he’s in the neighborhood and can he stop by? So, not wanting to freak him out with the sight of a wedding dress, she hung it outside as she heard him climbing the steps to the fourth floor. 4) A woman was stood up at the altar. She doesn’t know what happened to her true love. Surely he wouldn’t have left her like that? She was his carina bambina. Perhaps he was kidnapped or murdered; a girl can dream. 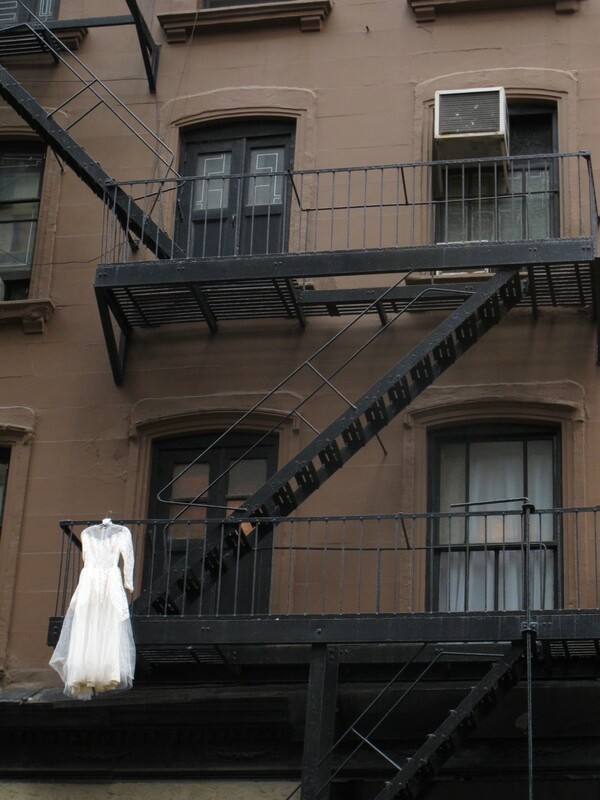 Lonely, inconsolable, each day she hangs the wedding dress on the fire escape as a message to Paolo like a candle in the window, just in case he happens by her street, to let him know she still loves him, still wants him, and would marry him in a heartbeat if only he’d return to her. 5) A young woman’s great-grandmother died in Kansas City, Missouri. After the funeral, her mother sent her a box of GG’s favorite objects, including her engraved letter opener, a vintage hand mirror, and this wedding dress. Mom included a not-so-subtle note that hopefully this dress will “come in handy in the near future :-)”. Unfortunately, the dress reeks of mothballs, mildew, and time, and the young woman quickly decided it must be given a thorough airing-out. She fluffed it over the fire escape, a few old bugs and memories of GG fluttering out, escaping, vanishing into the New York summer sky. 6) The upstairs neighbor has killed himself in a most dramatic fashion: a hairdryer in the bathtub. The tub overflowed and leaked into a young woman’s apartment just days after she’s delightedly received her wedding dress and hung it in front of her bed to admire. She rushed it out to dry on the fire escape, above which the same neighbor once tried to kill himself by throwing himself off his fire escape. 7) A female artist is making a statement against the wedding industrial complex and the patriarchal tradition of marriage itself by flagrantly disrespecting its greatest symbol, hanging it outside to be ruined by weather, time, and neglect. 8) A female artist is making a statement about marriage by installing her own wedding dress on her fire escape, displaying the institution’s impressive capacity to withstand the symbolic elements of rain, snow, wind and sun, and the literal elements of time and neglect, all in the public eye. 9) Picked up at a thrift store in Chelsea by a costume designer currently working on this divine (read: ultra low-budget) dark musical about a bride who murders all her husbands on their wedding nights, titled Black Widow: On (not-)Broadway! While floofing it out, a cockroach scurried out from between the folds, and the costume designer shivered and dashed it out to the balcony (read: fire escape) to shake it free of any remaining vermin. Best to give it a full afternoon outside and let the little buggers escape, he thinks as he beats it with a prop cane, then heads inside for a 4 p.m. martini. 11) It’s not there at all. It’s all been a figment of my imagination.